We have the continuing education training that water operators in Wisconsin need to renew a license. We provide high-quality educational courses that are approved by the Wisconsin Department of Natural Resources to satisfy continuing education requirements established by the State. What are the CE requirements for Wisconsin water operators? Continuing education requirements are based on the renewal cycle for certifications. Certification must be renewed every three years. Most Grade T and Grade 1 operators require 18 hours of continuing education. Surface Water Operators with the operator-in-charge designation need 24 hours. Save on our 18 Hour CE Package. Includes: Source Water (2.5 CEH), Coagulation (3 CEH), Sedimentation (3 CEH) Disinfection (2.5 CEH), Corrosion (3 CEH), Oxidation (2 CEH) and Membrane Processes (2 CEH). This course will fulfill 4.5 of your required hours for Wisconsin water operators. 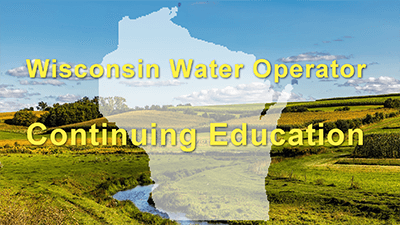 This course will fulfill 2.5 of your required hours for Wisconsin water operators. Continuing Education Credits in the Wisconsin DNR’s Operator Certification Program.